Soak Urad dal for atleast six hours. Grind dal in to fine paste with out adding water. Sprinkle little water if required while grinding. Beat the dough with hands for aeriation if batter is grinded in mixie. Now add hing, Peppercorns, curryleaves, salt and cumin. Take some pinch of batter and drop in to water. It should float in water. This should be right consistency for making vada. Now, add chopped coriander leaves and onion and mix well. Dip hands in water and make small ball with little hole in it. Drop it in oil and deep fry the vada. 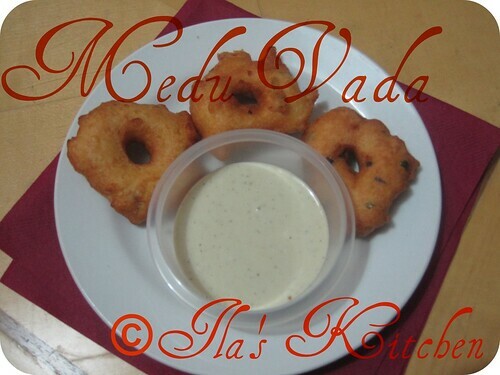 Now, yummy Medu Vada is ready to serve. This yummy South Indian Recipe can be served with Ven Pongal for breakfast and also for evening snacks. Wow,lovely cute vadas all time favorite in our home,looks so nice n delicious.. This is the one I always ask for when I go for breakfast to any restaurant in Bangalore..Looks crispy and yummy..
My all time favourite vada. Thanks for posting this timeless recipe. 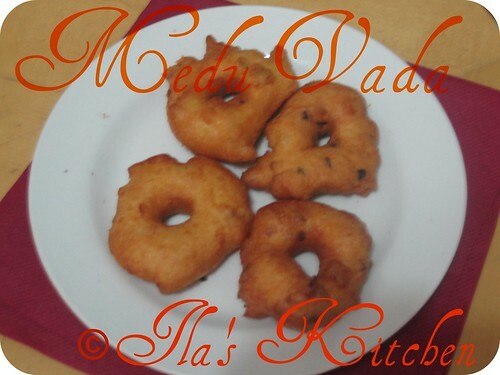 Medhu vada looks delicious, my mom's favorite. Looks super tempting and irresistible. One of my fav vada !! love to have with sambar !! looks so inviting and delicious !! Welcome back and keep rocking.Yummy vadas. Ila, you are back with a bang! I love vadas and this is my favprite. Simply irresistible...that last picture is making me crave for them now!